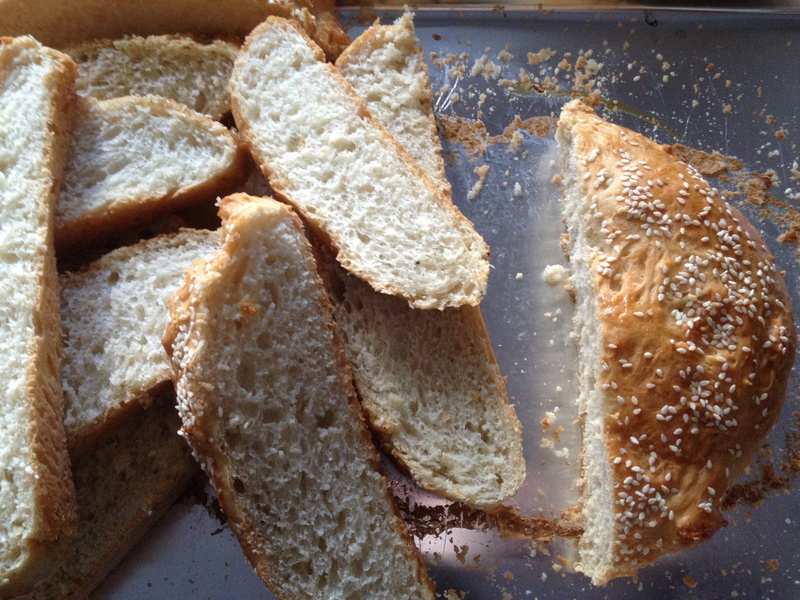 My aunt would make this sweet bread (artos) for Great Vespers services when we were young. Five loaves would go to church and one small loaf stayed at home for us. She would slice up the small home loaf and toast the slices in the oven until dried through and super crunchy. 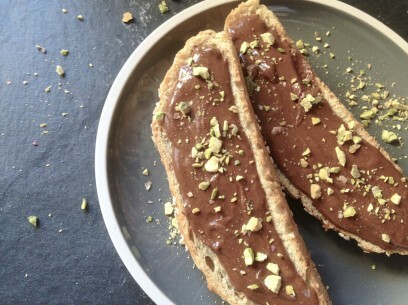 Then we’d slather them with Merenda (Greek hazelnut spread similar to Nutella) and very happily munch through every slice! 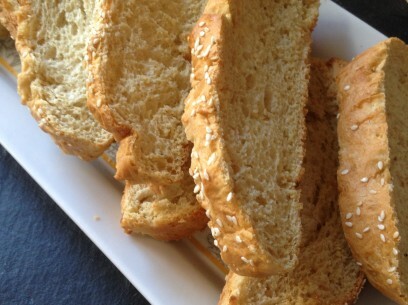 You can enjoy these sweet rusks today, store bought and straight from Greece, or make your own – a wonderful rainy Saturday recipe! These sweet rusks are delicious on their own with a hot cup of coffee or topped with your favorite jam or Greek honey and the perfect afternoon snack. Traditionally from region of Sfakia on the island of Crete but enjoyed throughout Greece and the Greek diaspora, you will fall in love with this authentic, simple sweet snack. Tip: When using Justin’s Chocolate Hazelnut Butter – sit jar in a bowl of hot water for a few minutes to soften, then stir until creamy smooth and spreadable! Want to make your own sweet rusks? It’s easy and, though a bit involved, it can very simply be broken down into manageable stages. This recipe showcases something unique to Greek/Middle Eastern baking – the use of fragrant waters in dough. Fragrant water is infused with the essential oils of many different spices. 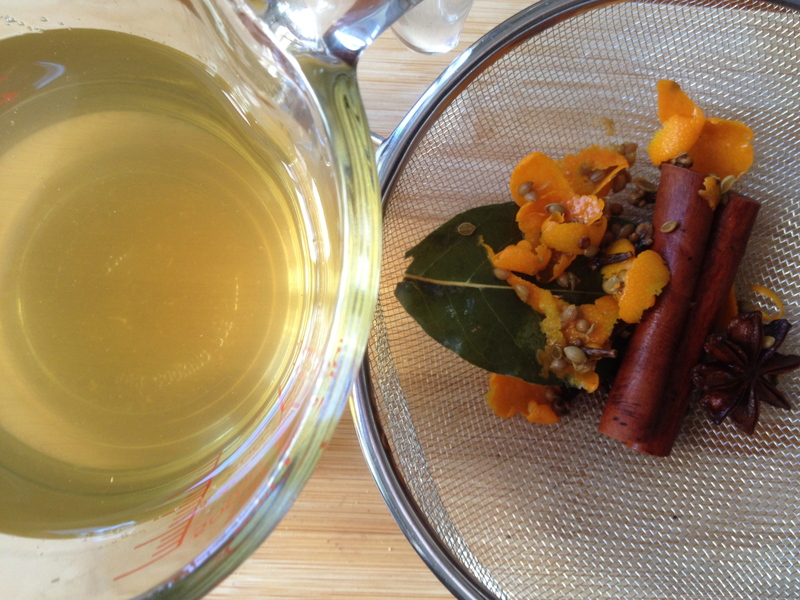 In this case, we add anise seeds, cinnamon sticks, orange peel, coriander seeds and bay leaf. Boil these for 5 minutes, allow to sit until completely cooled and you have fragrant water (and a fragrant kitchen!). I start with the fragrant water as my first step in this recipe as it can be set aside until you are ready to use it, up to 3 days covered in the refrigerator. By adding the sugar and brandy to the fragrant water after about 10 minutes and by grinding your mastic gum, cardamom and anise seeds together, you’re able to incorporate every one of these amazing flavors into every crumb of your bread. 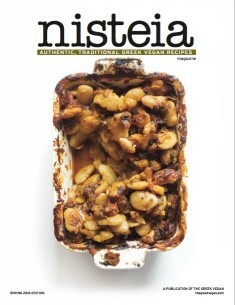 Flour, yeast, olive oil, sugar, a pinch of salt and you’re good to go. I get the yeast going about 20 minutes or so before I’m ready to put the dough together. Then, while the dough is proofing, I grind my spices, combine with my dry ingredients and set aside. 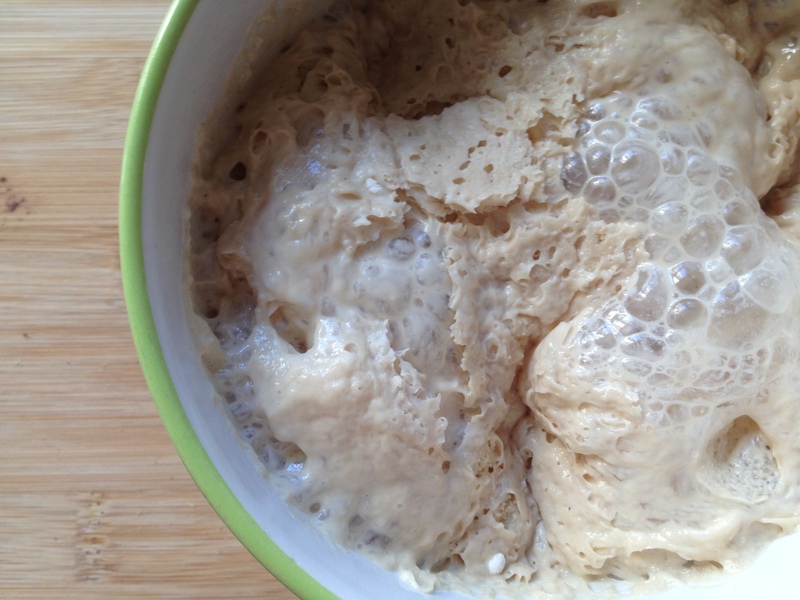 As always – when working with yeast, check it after 2 or 3 minutes to make sure you see bubbles forming. If you don’t see bubbles, throw it away as your yeast is no longer active and your dough will not rise! Once the yeast has proofed up nicely – pic above is your ideal proofed state – add yeast to your dry ingredients and stir a few times to incorporate. Add the fragrant water, stir to combine. Add oil and mix well until all ingredients are completely combined and come together in a slightly sticky dough. Bake in 350 degree oven for 35 minutes until golden brown on top and bottom. Once your loaf has cooled, slice into inch or so wide pieces and place side down on a cookie sheet. Bake slices at 250 degrees for 45 minutes, flip and bake for another 45 minutes. Turn off oven and leave sweet rusks to cool completely in the closed oven. Store in airtight container or plastic bag. These last for weeks! Makes about 18-20 sweet rusks and is easily doubled. orange peel (peel 1 orange, just the orange – no white pith, it’s bitter! Boil water and all fragrant water ingredients for 5 minutes and set aside. After 10 minutes, add the sugar and brandy and set aside to cool completely. When cooled, strain before adding to dough. Mix yeast with half a cup of warm water, a teaspoon of sugar and a teaspoon of flour. Cover and set aside for approx 20 minutes until well proofed. Combine, mastic gum with sugar, ground cardamom and anise seeds together in spice grinder for a few quick pulses until ground and combined. Set aside. Combine flour, salt and ground spices completely with a fork. Make a well in the center and add proofed yeast. Mix to just combine. Add 1 1/4 cups fragrant water (with dissolved sugar and brandy) and mix just to combine. 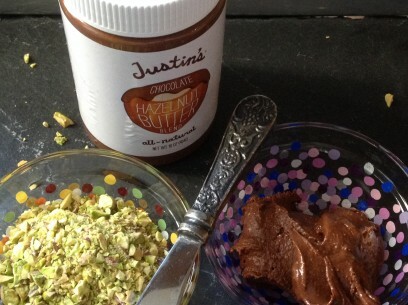 Add olive oil and mix well to completely incorporate all ingredients into a slightly sticky dough. Knead dough for 10 minutes, try not to add additional flour. Transfer kneaded dough into a clean bowl, cover and allow to rise in a warm place for 1 hour or until doubled in size. 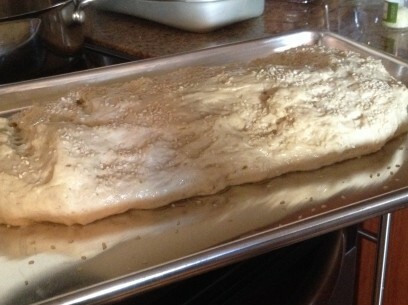 When dough has risen, gently punch down and transfer onto a baking sheet. Form the dough into 2 small or 1 large oblong loaf. Allow to rise for 15 minutes. Brush with sugar (or honey) water – 1 part sweet to 2 parts water – and sprinkle well with sesame seeds. Bake at 350 degrees for approx 35 minutes until loaf is golden brown on top and bottom. Remove from oven and brush once more with sweet water and sprinkle again with seeds. Set aside to cool completely. Once cooled, slice the loaf into 1″ thick slices and place, side down, on a baking sheet. Toast in 250 degree oven for 45 minutes, flip and toast another 45 minutes on second side. Turn oven off and allow sweet rusks to cool completely in closed oven. Store in airtight container for up to 6 weeks. That’s great! What church do you go to and where?! I cannot find anywhere how much sugar to add to the fragrant water? Did I miss that? can you take the brandy out? i dont drink. Thanks!